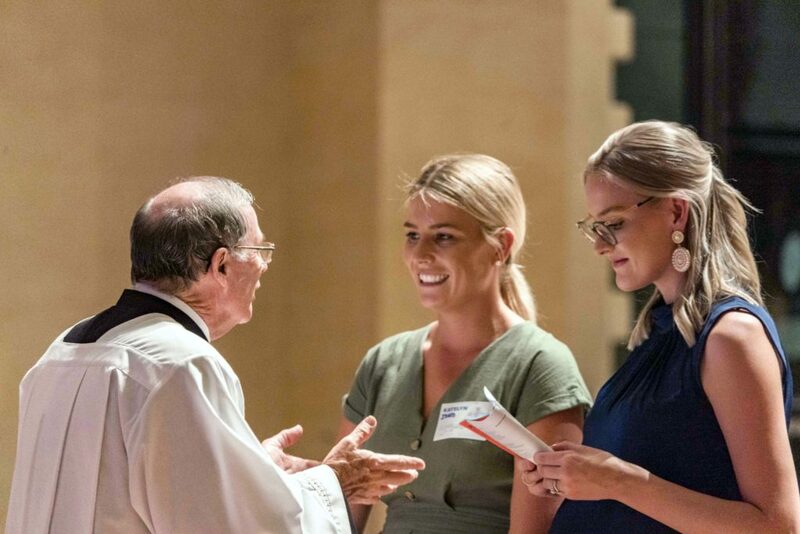 Perth Archbishop Timothy Costelloe SDB celebrated the Rite of Election of Catechumens and Formal Recognition of Candidates held at the St Marys Cathedral on 14 March. Photo: Josh Low. 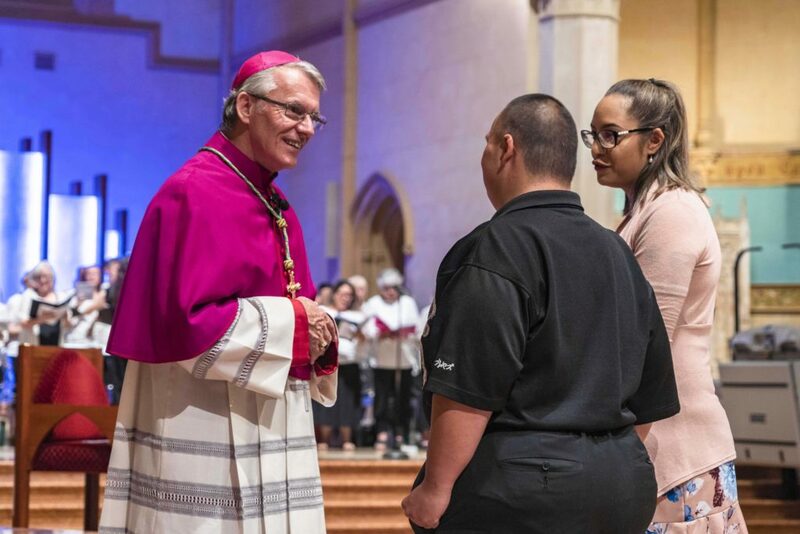 These were the words of Perth Archbishop Timothy Costelloe SDB, who spoke to some 132 catechumens and candidates at the Rite of Election of Catechumens and Formal Recognition of Candidates, held at St Marys Cathedral on Thursday, 14 March. Joining Archbishop Costelloe as delegates were Perth Archdiocese Vicar-General the Very Rev Peter Whitely VG, St Marys Cathedral Dean Father Sean Fernandez, and Chaplain to the Archdiocesan Rite of Christian Initiation of Adults committee Fr Phillip Perreau. The annual ceremony that takes place during the Lenten period, marks an important step in the conversion journey of both the catechumens (those unbaptised) and the candidates (those baptised from other Christian denominations). In this liturgy, the catechumens and candidates are elected or chosen by God to progress towards receiving the Sacraments of Initiation at Easter. 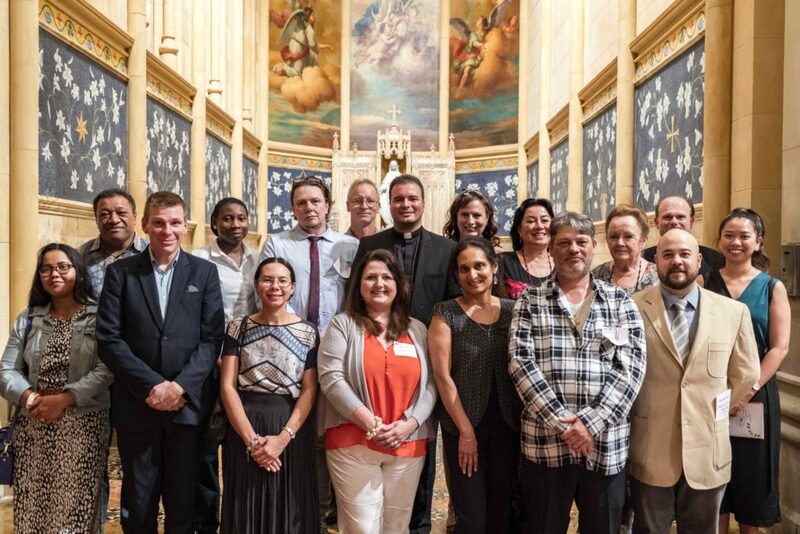 Some of the catechumens and candidates with their sponsors at the Rite of Election of Catechumens and Formal Recognition of Candidates held at the St Marys Cathedral on 14 March. Photo: Josh Low. Upon welcoming and thanking those present for their courage and faith commitment to the Church, Archbishop Costelloe in his homily, reminded the congregation that the Church remains a source of life and of hope because the Church, before anything else, is a community of disciples for Christ. Archbishop Costelloe continued by explaining that life in the Church is meant to gradually shape us into people who see with Jesus’ eyes, listen with His ears, speak with His words, and love with His heart. “In other words, the Church is here to help us walk in the footsteps of Christ, just as St Paul once said, ‘I am no longer living, for it is Christ who lives in me’,” Archbishop Costelloe said. “Jesus spoke so often and strongly to His first disciples about the need to have forgiveness at the heart of their lives together, and today, nothing has changed. “We Catholics will continue to sometimes let each other down, we will continue to lose our way, and become confused about what is true, and fail to let Christ live in us,” Archbishop Costelloe added. Fr Peter Whitely speaking to one of the catechumens during the Rite of Election of Catechumens and Formal Recognition of Candidates held at the St Marys Cathedral on 14 March. Photo: Josh Low. Despite the failures and infidelities within the Church community, Archbishop Costelloe affirmed the congregation that they will know, through their life in the Church, what God is asking of them, who He is calling them to be, and how to find their way back home. Addressing the candidates, Archbishop Costelloe went on to say that the Catholic Church which is a very human community, should always keep their eyes fixed on Jesus, and place all their trust in Him. “Jesus never gave up on his first group of disciples most of whom failed him badly and often,” Archbishop Costelloe said. “He hasn’t given up on His Church today and nor will He give up on His Church in the future. “You are joining us on our pilgrim journey as we do our best follow in the footsteps of our Good Shepherd, and you are very welcome here,” Archbishop Costelloe concluded.